Translation:Where can we buy a phone card? Although “SIM card” is also accepted, I think 手机卡 is better translation for SIM cards. The “phone card” here may refer to a card that both looks like and works like a prepaid credit card. It allows you to make a phone call from any public/private telephone. On the card there may be a special number for dialling out in case there is not a card reader. Do you know what does a telephone booth mean? I suppose that's a literal translation. It is absolutely accurate if one is old enough to know the existence of the public paid phone. 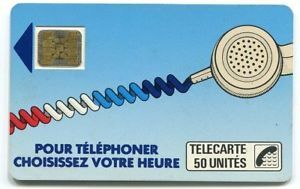 Before cell phones, I used a prepaid phone card to make long distance phone calls from any land line. I also used an international calling card to call home when I traveled abroad. With cell phones and internet calling, I think this type of phone card is becoming obsolete. This particular lesson is quite repetitive in it's examples. Error or intention? Is it just me or is this skill the same three exercises over and over again? Presumably these days this means a sim card. What do you mean by "also"? I thought the semantic word order is rather fixed, otherwise the meaning would change. Any thoughts, anyone? The spaces are used to make the association between words more prominent. Don't remove 有 or 在 unless you understand their roles in the sentence. Hope this helps. Wow! Thanks for the great answer! I don't think I understood all the nuances yet but it gives me a great starting point to start figuring them out. An important note: Without any stress or unusual intonation, more specific information usually comes later in the sentence.